The Back to the Future trilogy has very little food-centered action, and I couldn't think of many puns. I started with ideas of foods that look like clocks, but for a birthday celebration, that slips into vanitas territory fast. We did have pigs in a blanket shaped like a clock though, because pigs in a blanket wouldn't make anyone think of death. For dinner, we had pizza inspired by the rehydrated pizza in the future. Thomas suggested Pepsi products, so I think you could get a mixture of futuristic packaging and glass cans, Those are the easiest lifts right from the movie. This was for an 80's party, but I wonder if with enough creativity, you could make them look like Biff or Griff's crew. 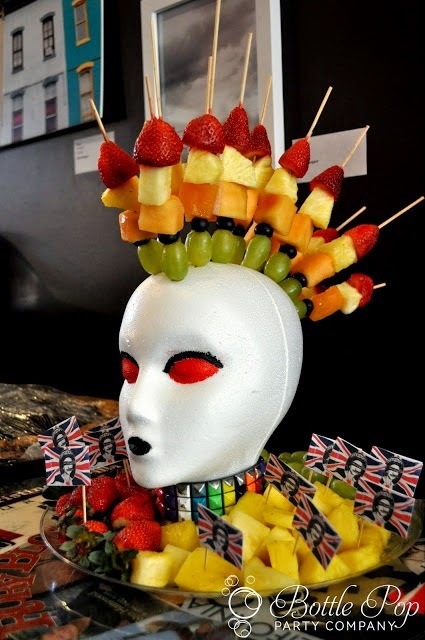 Billy Zane in fruit would spice up a party. 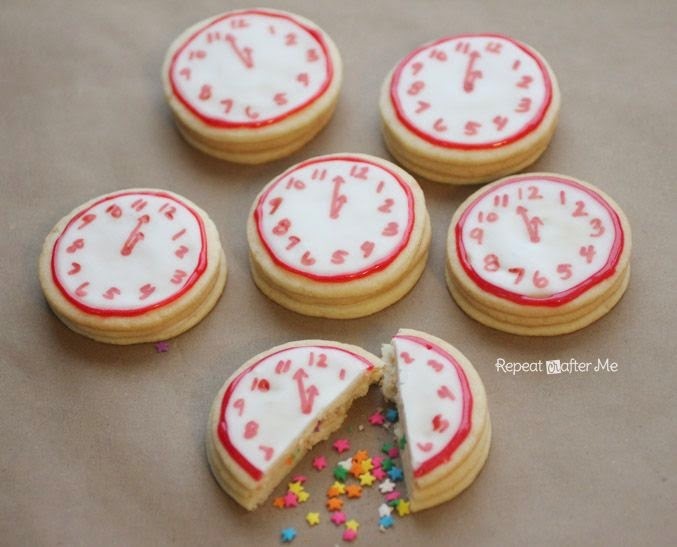 Some sort of clock cookies makes a lot of sense too. I actually wish I would have done this! I had a lot of ideas for the decorations, but I didn't pull them all off. My original plan was to decorat 3 rooms- one as 1955. on as 1985, and one as 2015. I didn't have enough stuff to really nail the concept, so everything went in the living room. 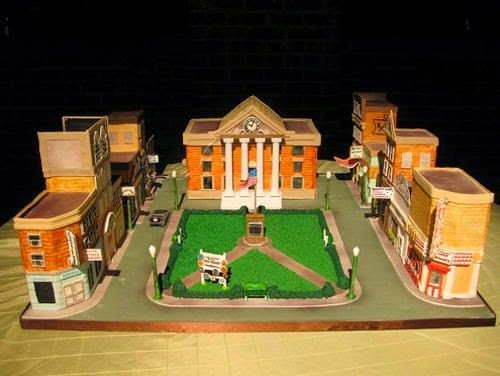 There are a LOT of iconic, flat, and totally repeatable forms in the film, so you can make a lot yourself- a speed limit sign, hover boards, the outatime license plate, the almanac, a poster for the Enchantment Under the Sea Dance, Really, tons of options! For lighting, I got some of that tube lighting which looks a little 80's futuristic. You could also get some white twinkly lights for the Enchantment Under the Sea portion. I got the Marty McFly and Deloreon popable on Amazon, and ven though it was a little bit expensive, they added something a little more concrete (and went to live as a toy in the Boy's office). I also looked up some straight 80's decor, which are mostly horrible neon things, but having a tablecloth or two to hang never hurt a transformation. You could also get the black and white checkered tablecloth like the nostalgic 80's diner had. You can see most of the dance decor behind The Boy. I thought the streamers would work, but they honestly looked a little jank. Still, you can do a big chunk of the room this way with clear balloons and 2 shades of teal and blue crepe paper. So less than 20 bucks with big impact, depending on how you use it. A giant clocktower clock for on the wall. I had all the pieces ready for this bit, but I just never made it there. You could even write something on the hands of the clock and make it a focal point of the room (again, failed idea). You could make this can full of candy or party favors or something? You could even do a collection of them for the food table. Are you noticing a theme of half done or not well-executed ideas? Such is life. 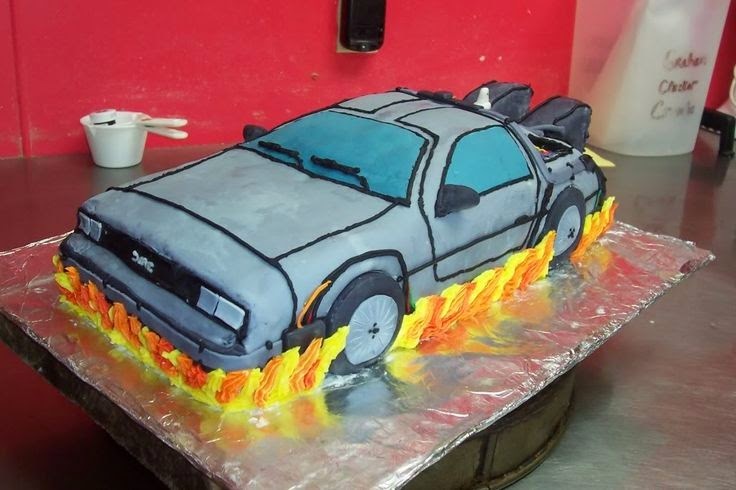 The cake is meant to be the dashboard on the Deloreon, with his birthdate and party date on it. 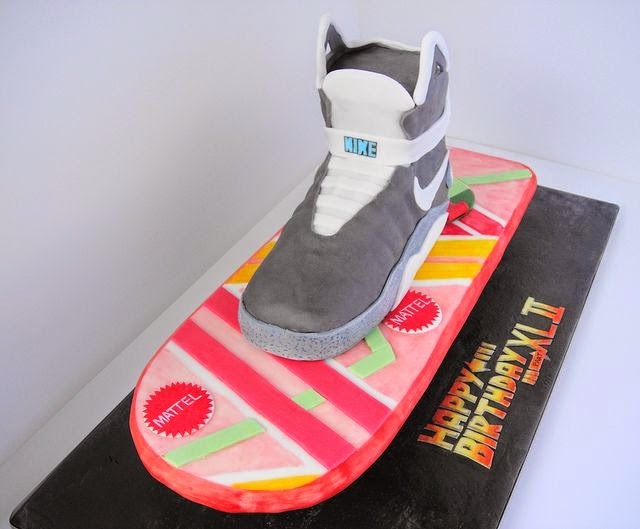 I think more time to smooth the frosting and some metallic sparkle would have taken the cake to another level. 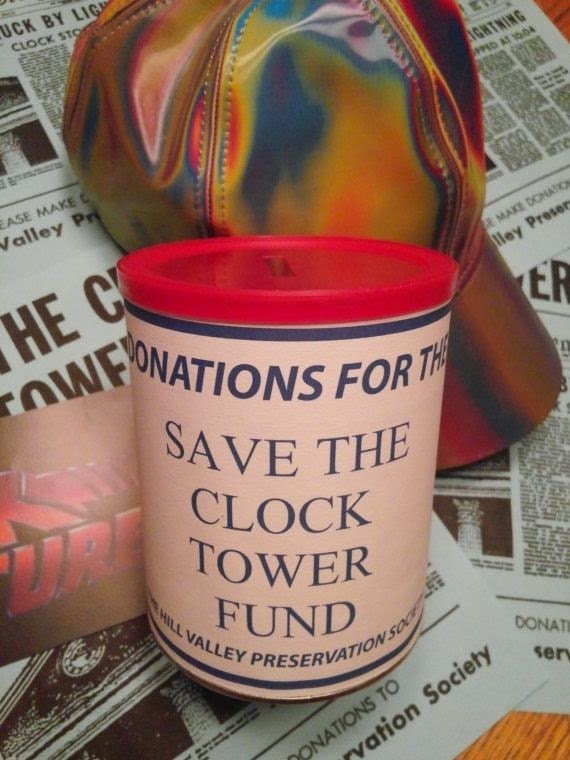 Back to the Future pulls up a great search on Etsy, and you can get lots of funny t-shirts and onesies. I learned this yeear that going all out on costumes doesn't make much sense- them t-shirts and funny hats do the trick if the goal is to stay in pajamas and watch movies all day. If you want to go all out on costumes for your party, you can get almost all the doc brown pieces for cheap at a hardware store. I bought the Marty McFly puffy vest at Old Navy for 3 bucks and the hat on Amazon. It was a bit of a splurge, but come on, it is awseome. The only idea I had I wished I followed through on was taking the baby's rocking dog and turning him into Einstein. So these are my ideas! Good luck on your party!